As requested in comments, here’s a picture of a cross-section of the million dollar cookie. These cookies are made by rolling refrigerated peanut butter cookie dough around a mixture of peanut butter and confectioners sugar. 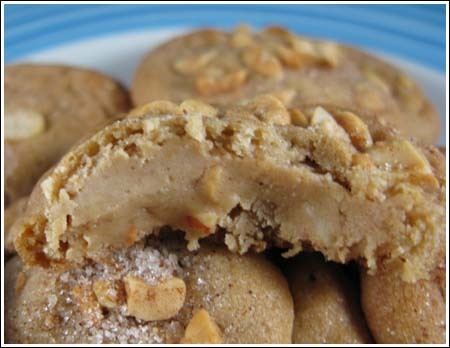 Here’s a link to the recipe — Double Delight Peanut Butter Cookies. Anna, oh no, it stays on the counter, 24/7! It’s my best friend, my constant companion! 😉 Hubby gave it to me when we were first married (17 years ago!) It stays out… I actually just got out my food processor (using that cookbook “Deceptively Delicious” to sneak stuff into my picky kids! ), I just don’t use it as much! I made the DD PB Cookies today. They taste very yummy. I had fun playing with some of the cookies. I don’t care for the cinnamon addition, so I only did a few with the cinnamon sugar. I also think I started out flattening them too much. The store bought dough was very soft. I decided to chill the peanut butter balls in hopes that they wouldn’t melt into the cookie as much. We didn’t get to see a cross section of the winner, but they look pretty flat. The chilled ones didn’t flatten quite as much plus I didn’t smash them as thin. These are yummy. Then just for fun I also made two of the cookies where I had frozen the peanut butter ball, knowing it wouldn’t disappear into the cookie. While there was a noticeable bump in the middle, this was the best. One of my sons went ga-ga over them like this. I will be posting pictures on my blog, but may not get to it until tomorrow. AND, finally, I would totally use homemade cookie dough instead of buying the Pillsbury stuff, while it is okay, it just doesn’t seem as peanut-buttery as making homemade. It is still amazing that this cookie won one million dollars and I’m super happy for this fellow cookie baker. This is the most splendid, mouth-watering picture, ever. Michelle, I think I am a little concerned about your dependence on that stand mixer. Do you leave it out on the counter 24/7 or do you pull it out when you need it? I’m just curious. I only pull mine out when I’m making pound cake or whipping a bunch of egg whites. Otherwise, I like using a whisk or a hand held. I’m becoming a bit dependent on my food processor. It stays on the counter 24/7. Nicole, I commented on Baking Bites. I was going to try my own scratch recipe, but if you are curious as to how the two stack up, I’ll try with yours. I still have half a roll of peanut butter cookie dough and can make the cookies tomorrow. Ronna, some of my filling “balls” were bigger than others. This cookie had a particularly big filling ball so there’s a bit more. Also, I used a bit more peanut butter than called for. I used about 1/2 cup powdered sugar and 2/3 cup peanut butter, which is the usual ratio I use when making this type cookie filling. Hi Anna! I made these cookies today and I really wanted to love them. Maybe I made them too flat because I really couldn’t taste the filling. I liked the taste of the cinnamon and sugar on top, but to me, it just tasted like a peanut butter cookie with cinnamon and sugar on top. It didn’t wow me. I see the filling more in your picture, so, like I said, maybe I made them too flat. I was very happy that she won, though. She sounds like a sweet person and she lives about 1/2 an hour away from me! Anna – I just posted a homemade version on Baking Bites! I liked them a lot, although I admit that my expectations were super high to begin with. If you try them homemade, too, I can’t wait to hear how they turn out! I couldn’t find the refrigerated dough at my supermarket. I’d love to hear how the two stack up side by side. The filling from the million dollar cookie and a salted peanut/cinnamon/sugar topping. OMG. I want to take a bath in those cookies. That’s even better than I had pictured. Okay, I’m making those this weekend! I think some people in life, just aren’t happy unless they are complaining! All the more power to the winner, she did exactly what was required and won the money, good for her. I don’t think I’ll ever make stuffing using frozen waffles (no offense, Anna), but I think it’s awesome that such a thing was picked by judges and won! Has anyone read how mad people are on the pillsbury website, that such a simple recipe won? I can understand why but it’s done, it’s over and apparently these cookies are out of this world (which I will make on fri for a bakesale at the local SPCA) so why fill out? that cookie looks absolutely SCRUMPTIOUS. i know what cookie is next on my list to bake! Anna..I will happy..if you tell me the full making process. I have never bought a pre made cookie dough until tonight. Bought the dough so I can make the cookie tomorrow. Looks like peanut butter heaven!